Serta has partnered with HGTV, America's leader in home and lifestyle programming, to create an innovative new mattress collection designed to address your most common sleeping problems. The HGTV Green Home by Serta collection boasts some of today's most advanced comfort and support features, while also using technologies that are more environmentally friendly. From our Individually Wrapped Coil Innerspring made from 95% recycled steel to our soy-infused foams, every mattress in this new collection is created with materials designed to reduce impact on the environment while delivering the quality and comfort you expect from Serta. Individually Wrapped Coils with Foam Encasement: Premium individually wrapped coils are made from high-carbon tempered steel. Each coil correctly conforms to your body while also reducing potential disturbance from your sleeping partner. Plus, our advanced foam encased design expands the sleeping surface while eliminating potential edge "roll-off". Available in all HGTV Home by Serta innerspring mattresses. Soy-Infused Foams: These premium comfort and support materials are made using natural soybean oil. This reduces CO2 emissions and requires less energy during the production process. 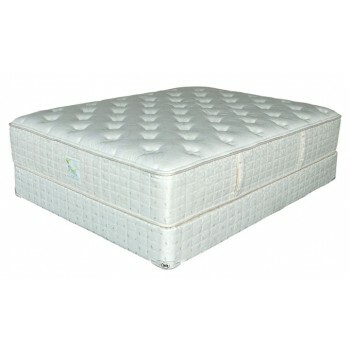 Plus, our Soy-Infused Foams provide gentle cushioning and enhanced comfort to the mattress. Available in all HGTV Green Home by Serta innerspring mattresses. Organic Cotton & Linen Covers: Every HGTV Green Home by Serta mattress features soft, breathable and exceptionally durable fabric covers made from Organic Cotton and Natural Linen materials. Our 100% organic cotton is grown with no harmful materials. It is naturally soft, breathable and allergen free. Linen is a natural fabric that is exceptionally soft to the touch and naturally strong, for long-lasting comfort. Available in all HGTV Green Home by Serta innerspring mattresses. Cool Nature Temperature Regulating Latex Foam: Cool Nature is a revolutionary new temperature regulating Latex foam made using sap from a rubber tree. It responds to your body by absorbing and releasing heat as needed, creating the ideal temperature for you at the sleeping surface. Plus, Cool Nature Latex responds instantly to your body for superior pressure relief where your body needs it most to help you stay comfortable throughout the night. Available in select HGTV Green Home by Serta innerspring mattresses; see retailer for details. KoolComfort Memory Foam with EcoSense: KoolComfort Memory Foam with EcoSense is the first memory foam to incorporate minimally processed plant based ingredients. Serta's unique KoolComfort Memory Foam provides pressure-relieving comfort while helping to regulate the sleep surface temperature throughout the night. This foam contours to the shape of your body, reliving pressure points that can cause tossing and turning, so you can enjoy a more restful night's sleep. This unique open-cell structure of the foam allows it to breathe up to 95% more than traditional memory foam, providing a cooler and more comfortable sleep surface. Available in select HGTV Green Home by Serta innerspring mattresses; see retailer for details. Serta Memory Foam: 2" of Serta's space age Visco-elastic Memory Foam rest on top of a Hi-Density Foam Core to provide pressure-relieving comfort at the sleep surface. Memory Foam gently conforms to the body while reducing pressure build up that can cause tossing and turning. The result is an extremely comfortable and more restful night's sleep.